Maria Mazzurco, laboratory technician in Biology, recipient of the Ronald Kent Medal in the President’s Staff Recognition Awards. 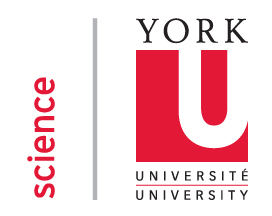 The medal honors contributions of employees who promote and strengthen collegiality, spirit and goals of York University. Jane Heffernan (Mathematics & Statistics) on receiving the 2015 CAIMS/PIMS Early Career Award in Applied Mathematics, presented by the Canadian Applied and Industrial Mathematics Society (CAIMS) and the Pacific Institute for the Mathematical Sciences (PIMS). The prize recognizes exceptional research in applied mathematics. Sampa Bhadra (Physics & Astronomy) on being named to the A-List of Indo-Canadians, who represent leaders and mentors in the community. Paul Delaney (Physics & Astronomy), recipient of the 2015 Qilak Award from the Canadian Astronomical Society (CASCA) for his dedication to improving public understanding and appreciation of science and astronomy. Bach Kim Nguyen, undergraduate working with Jennifer Chen (Chemistry), on winning first place for her oral presentation on “Plasmonic nanoparticle assemblies for the detection of biomarkers” in the analytical division at the Southern Ontario University Chemistry Conference. 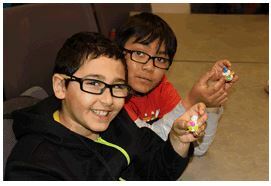 The March Break Science Camp was a big success, more than doubling our reach from last year with over 75 participants. 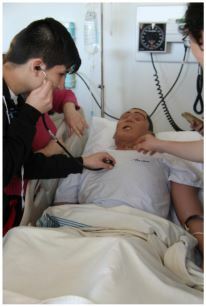 From visiting the Nurse Simulation Lab to building their own Gene Bug, hands-on experiments had students praising their experience. We are excited for the upcoming summer, and registrations for our Sci-X: Science Explorations Summer Camp and Helix Summer Science Institute have begun. The Faculty of Science received a PromoScience grant from NSERC for QuantumGirl. The PromoScience program supports organizations that encourage youth to take an interest in STEM disciplines. Congratulations to the Science Engagement team! The #YorkU #WomenInSTEM event was a great success, bringing together students, grads and faculty members for wide ranging discussions about careers and more. Our thanks to the main organizers –Dawn Bazely (Biology), Sampa Bhadra (Physics & Astronomy) and Michael De Robertis (Physics & Astronomy) – as well as to the many others who pitched in. The final four Neuroscience Lecture Series talks by Derek Wilson (Chemistry; who stepped in for Georg Zoidl at the last minute), Kari Hoffman (Psychology, Faculty of Health), Laurie Wilcox (Psychology, Faculty of Health), and Thilo Womelsdorf (Biology) were delivered to capacity audiences at the various Toronto Public Library branches. Given the success of the series, we plan to continue this partnership with Toronto Public Library. Our thanks to Associate Dean Peter Cribb, who spearheaded the organizing on our side. Our girls in STEM initiatives were featured in a Canadian Press article, which appeared in numerous media outlets around the country, including NewsTalk 1010 and Vancouver Sun. Chris Bergevin (Physics & Astronomy) published a study in Proceedings of the National Academy of Sciences (PNAS) about how barn owls and lizards could help us to better understand hearing loss in humans. He was featured in The Hearing Review, Science Daily, and a yfile article. Emanuel Rosonina (Biology) published a study Nature Communications about how living beings can keep gene expression in check, which may help explain the uncontrolled gene expression found in many cancers. The National Geographic’s Water Currents reported on Sapna Sharma’s (Biology) recent paper on lake temperatures and ecological effects of climate change. Bridget Stutchbury (Biology) was featured on the CBC’s The Nature of Things SongbirdSOS episode. Biology PhD student Scott MacIvor and supervisor Laurence Packer (Biology) published in PLOS ONE about how useful bee hotels are in native bee conservation. Dean Ray Jayawardhana quoted in a Cosmos magazine article on the upcoming James Webb Space Telescope.